Someone asked for these today, so I've decided to put them all in one blog entry! 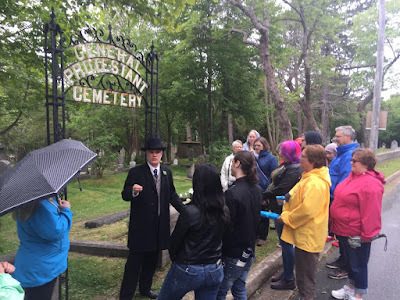 Exploring God's Acre: The Moravian Church Mission Graveyard at Hebron, Labrador. Newfoundland Ancestor, 13.2 (Summer 1997): 93-95. Jarvis, Dale Gilbert; Drover, Kelly. Jarvis, Dale Gilbert; Barrett, Terra; Elliott, Heather; Li Xingpei. Tombstones and Tea is sold out? What can I do? Tombstones and Tea walking tour of the General Protestant Cemetery. 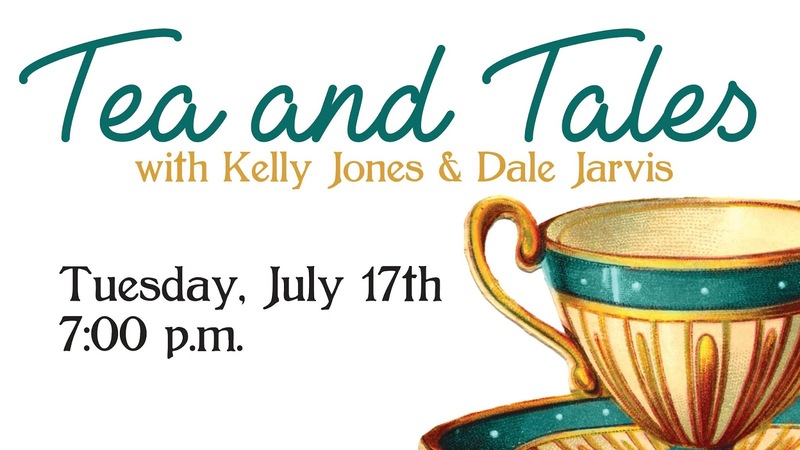 Join tea lady Kelly Jones and storyteller Dale Jarvis as they celebrate their love of tea with stories, tastings, and treats. As you listen to stories of missing eyelids, wise dragons, haunted tea plantations, and the Iron Goddess of Mercy Herself, you will sample four varieties of tea. Learn about proper brewing techniques, and take away tips to make a perfect cup. Safe from diseases and decline. There are several markers from the 1880s in the cemetery noting that the individual interred died of diphtheria. 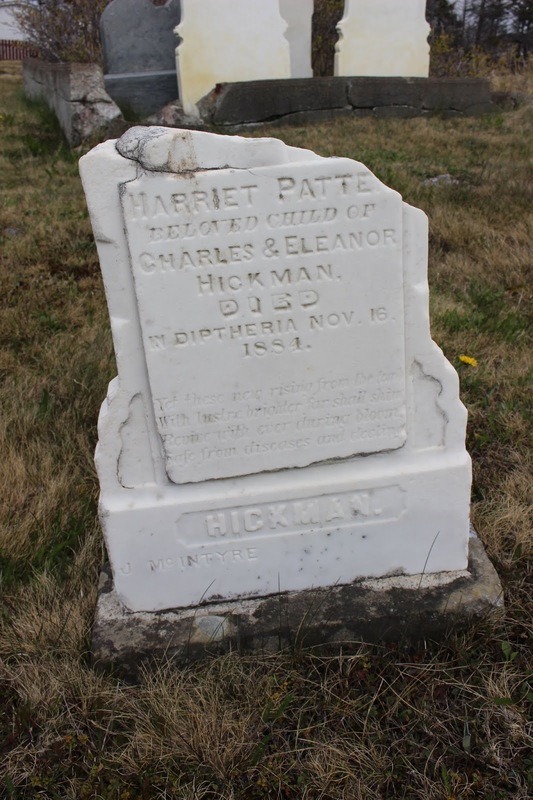 Archivist Larry Dohey has noted, "A diphtheria epidemic raged throughout Newfoundland from 1888 -1891, medical officials identified at least 3,183 cases and it had resulted in at least 624 deaths." The phrase "died in diptheria" is intriguing. Other markers in the cemetery use the phrase "died of" rather than "died in." Also, the spelling of diptheria (without the first "H") seems to have peaked in the 1860s, and then was surpassed and largely replaced with the current spelling of diphtheria. As fearless of the evening cold. The short-lived beauties die away. And sweeter than the virgin rose. If firm the word of God remains. The stone carving itself is attributed to J. McIntyre, and is most likely the work of the Standard Marble Works, a St. John's-based firm under the direction of James McIntyre, as advertised below in the Evening Telegram of 1892-09-05. A high percentage of the monuments of the same period in the cemetery bear the maker's mark McIntyre or J. McIntyre. The stone is somewhat damaged along the top and top right, but it could have potentially been topped with a carved lamb, a common motif for the markers of children, and a motif seen on similar monuments in the cemetery. 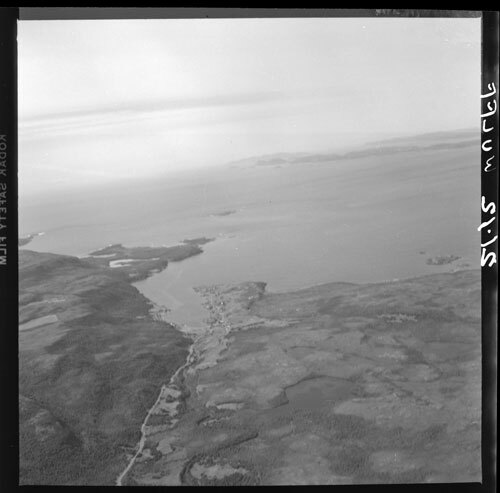 In the early part of the twentieth century, the waters of Placentia Bay between Come-By-Chance and Sound Island, Newfoundland, were said to be the location of an unearthly red glow, which would appear under very specific weather conditions. By Jamieson’s reckoning, he had witnessed the light sometime around or before 1913. As he had watched, the light had appeared, seeming to come up from out of the depths of the sea. An old local gentleman had waited up with the author to see the light. As Jamieson “gazed with awe struck attention” at the strange gleam upon the water, the old man told him the story of the light’s origins. Just off Come-By-Chance Point, their luck ran out. A storm sprang up, and the three were overtaken in a gust of wind. The open boat overturned, and all three men were drowned. 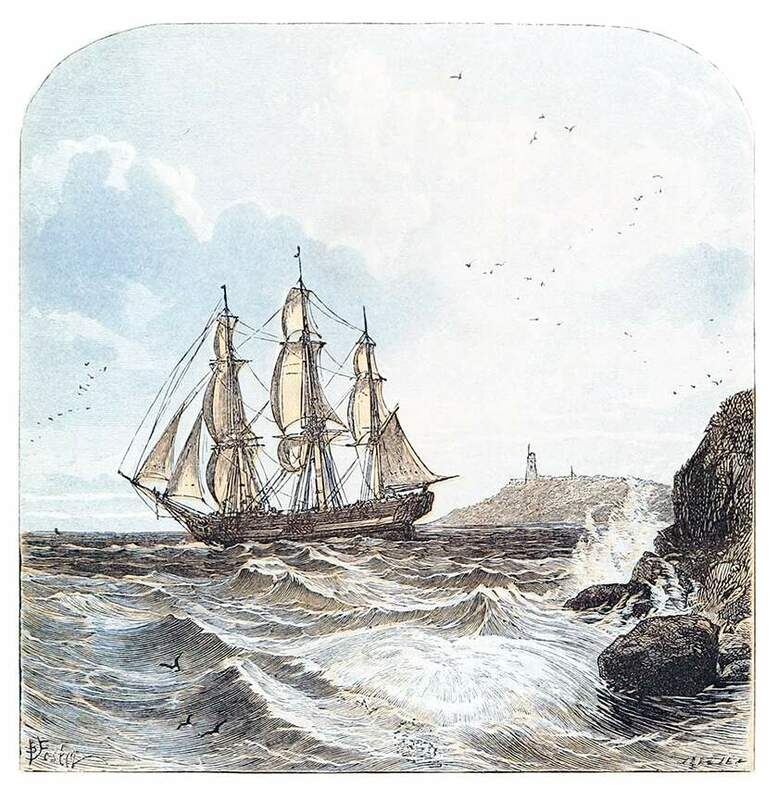 This belief that the light appears in times of bad weather is tied to the Newfoundland tradition of what are known as “weather lights”, the gleam or flicker of light at sea thought to foretell a storm. In some locations, such as with the Come-By-Chance light, weather lights are closely associated with specific tragedies at sea. This type of visual warning of an advancing storm system can even be associated with quite dramatic visitations, such as the ghost of the SS Bluejacket which appears in Conception Bay to presage storms. Interestingly, it was also noted in 1928 that just behind Come-By-Chance Point was a swamp which also had a reputation for strange lights. The swamp was said to associated with tales of “Jack-o-lantern” fires, known in other places as the Will o’ the Wisp, a mysterious bobbing bit of fire known at times to lead the unwary to their doom. If there was a link between the red lights off Come-By-Chance Point and the inland Jack o’ Lantern lights, it has never been explained. The two stories, while involving a similar type of light, are probably part of two separate traditions in the area. If you feel you can shed some illumination on the area’s mysterious lights, please let me know! With its long history and vast geography, Canada has no shortage of strange tales. There are haunted coal mines in Cape Breton, poltergeists in Calgary, and even a pair of haunted boots in St. Vincent’s, Newfoundland. It is no wonder, therefore, that golf courses across the country are home to some extraordinary spirits. Winning the award for the spookiest name for a Canadian course is the Haunted Lakes Golf Club in Alix, a town east of Red Deer, Alberta. Haunted Lakes Golf Club is a nine-hole course, with three sets of tees on every hole so golfers can alter the play of each hole if they choose. With water in play on four holes, the fairways range from heavily treed to open. Most important is the third fairway, where Haunted Lake hugs the front right of the green. It is here an ancient drama plays out every winter. Before Europeans arrived, indigenous groups camped on the lake’s eastern shore. One winter, seven hunters camped there for the night. In the morning, they looked out across the lake and spied the magnificent head and antlers of a deer caught in the ice. The seven headed off. Reaching the creature, they started to chop away at the ice. The mighty animal, very much alive, gave a great heave and smashed through the ice. It swam for the shore, breaking a path before it. The deer made it to shore and the safety of the woods, but the men were not so lucky. They plunged through the ice and drowned. It is said the seven hunters haunt the lake, giving the spot its name. It is also claimed that every winter, a mysterious phenomenon can be observed. Each year a huge fissure appears in the ice along the path the deer travelled to the shore. The village of Alix is no stranger to creepy things lurking about its lakes. In addition to the Haunted Lakes ghosts, Alix is home to a mysterious lake monster. In 1979, Robert Plummel saw a large dark object moving through the water, and numerous reports have been filed since. In July 2002, a group saw an object moving in the water 50 meters from shore. The beastie swam for about 30 seconds, submerged and then resurfaced. A month later, a resident complained about a large animal lurking near his back yard. Locals speculate the lake monster is an alligator, released when the pet grew too large to manage. If it is an alligator, it could give the phrase “water hazard” an entirely new meaning to Alberta golfers. To the east, in Oakville, Ontario, Glen Abbey Golf Club may not have an alligator, but it does have a ghost. Glen Abbey is home to both the Royal Canadian Golf Association and the Canadian Golf Hall of Fame and Museum. Karen Hewson, director of the Hall of Fame, filled me in on Glen Abbey’s haunted history. “There is a house on the property that was built in 1937 by a mining engineer as his weekend retreat,” says Hewson. The engineer, Andre Dorfman, was a leading figure in the Canadian mining industry, involved with companies like INCO and Noranda. In 1953 Dorfman sold the house to the Jesuit Fathers of Upper Canada as a retreat. The property was sold again in 1963 to businessmen who opened a golf club. In memory of the Jesuits, the course was given the name “Glen Abbey.” Soon after, a spectre made its presence known. The mansion is a good example of the stately homes built in Oakville in the early twentieth century. It is constructed of stone with a red clay tile roof, and features a wood-lined library on the second floor. “One of the rooms in the basement is actually made to replicate the ship in which the original builder came over from Switzerland,” says Hewson. Originally known as RayDor Estate House, the building has been designated as a heritage property. Before 1975 it served as a clubhouse. The ghost in the old mansion is said to be male, and eyewitnesses agree that it resembles a Jesuit father. Dean Baker was superintendent at Glen Abbey from 1989 to 2000. He started work there as a high-school student in 1977. One night a friend had a creepy experience. The friend was cleaning up, and had closed the lockers. The phone rang, and he went downstairs to answer, finding a dead line. He went back up the winding staircase and found a number of lockers open. The friend scratched his head, closed them, and continued working. The phone rang again, and again the line was dead. When the young man went upstairs, every one of the 50 lockers was open halfway. For eight years, Baker lived on the property, and was often the first to respond if the security alarm sounded. He would often take one of his Labrador retrievers along. A stone corridor in the basement led to a spot which once held the Dorfman safe. I asked Karen Hewson if the ghostly legend was still alive. She told me the phantom was last seen about 1990, but a clammy draft in the basement, where Bailey had been so terrified, has been reported since. “I’m in the middle of doing a project that is a tour of the area, and we mention the ghost, so I guess in a way we are keeping it alive,” she says. If the ghost is still there, he has not appeared visually in years. “It is rented out now to some investment companies, and I haven’t heard any of them come screaming out, saying they saw a ghost!” Hewson adds with a laugh. On the other side of the country, Victoria Golf Club boasts both an impressive course history and the odd ghost or two. The club is the oldest course in its original location in Canada, beautifully situated on a rocky point on the southern end of Vancouver Island. The club dates to November 1893 when enthusiasts negotiated for permanent rights to play the rough fields of Pemberton Farm. Originally, golfers were prohibited from using the grounds over the summer, when cattle grazed what would become today’s fairways. Like Haunted Lakes, the Victoria Golf Club may be haunted by early aboriginal inhabitants. One researcher suggests that some of its phantoms may be souls of native warriors killed in battle centuries ago. However, these spirits pale beside the club’s other resident, the late Doris Gravlin, possibly Victoria’s most famous ghost. The expert on Doris is John Adams. 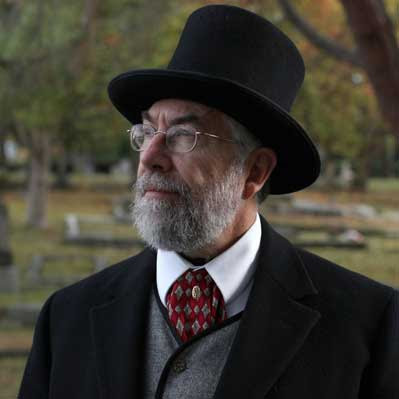 A historian and author, Adams is best known as the proprietor of the “Ghostly Walks” tour, which explores historic courtyards and spooky places where spirits like Doris make their presence known. Canada with her parents,” recounts Adams. The Thomson family settled in Victoria where Doris’s mother worked at a private hospital. Doris became a nurse as well, until 1930 when she married Victor Gravlin. Victor was a sports reporter for the Colonist newspaper, spending many happy hours golfing with his brother Walter, head pro at the Uplands Golf Club. The hours Victor spent with Doris would prove to be much less happy. “When her husband began to drink heavily, Doris left him,” explains Adams, adding that Doris found work as a private live-in nurse. Doris stepped out for a walk at about 7:45 pm on September 22, 1936; Victor left his parents’ house shortly thereafter. One observer saw them together on Runnymede Avenue, but after that, neither was seen alive. Doris and Victor were reported missing, a search ensued, and days later, Doris’s corpse was discovered. The Victoria Golf Course website states “her body was later discovered amid the driftwood on the beach near the 7th green by a caddy looking for lost balls.” She had been strangled, and her shoes, belt and felt hat were missing. Gossips maintained that Victor had escaped. But they were wrong. The discovery of two bodies on the grounds gave rise to the notion the club was haunted, and many sightings have been reported since. One night in 2003, two grandparents drove to the course with their grandson and granddaughter. Today, Adams incorporates the spook into his storytelling business. Club management takes all of these ghostly goings-on in stride, and has even incorporated Doris into some marketing activities. Unfortunately for attendees, Doris refused to cooperate, remaining invisible. According to Adams however, this has not stopped some from working Doris into their own tall tales. “Some of the club members claim they now have an excuse for why their golf balls veer off into the bushes or the ocean at that place,” he says. All in all, Doris seems to have been accepted, with a bit of good-natured scepticism, as part of the club’s folklore. Curious about all these golf course ghosts, I asked one golfer if he had ever experienced anything supernatural whilst hitting the links. An earlier version of this article appeared in Golf Canada Magazine. Doug Wells, a retired teacher in Harbour Breton, Newfoundland, sent me a series of articles on local culture. 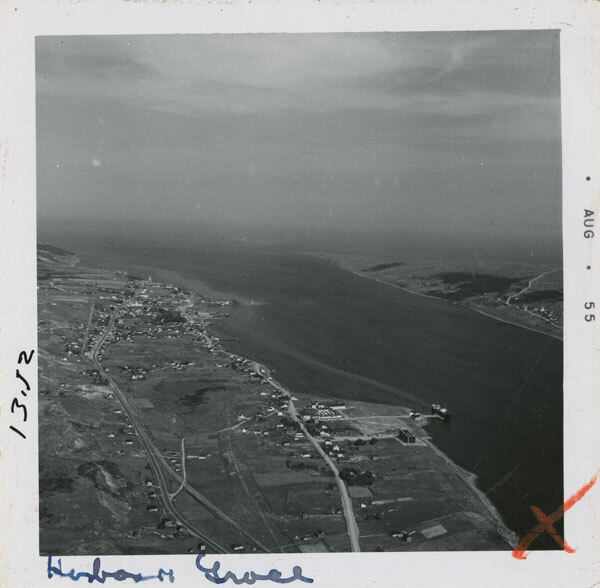 From curing warts to local legends, the articles give a wonderful introduction to the folklore of Harbour Breton and area. One of the Culture Corner research projects was completed by students Melissa Skinner, Damian Power and Joanne Hynes, of King Academy, in 1997. The three of them worked to retell the legend of Deadman’s Cove. During the class research, they found many people had stories of shipwrecks and bodies associated with Deadman’s Cove. One story, however, stood out. This was a particularly thrilling tale which had been written down Ron Rose of Harbour Breton, sometime around 1975. According to local folklore, the evil spirits of the wrecked sailors either took on the form of savage wolves, or possessed the bodies of wolves in the area. It was reported that several sailors met an untimely end due to these fearsome creatures. John Maunder, in a research paper revised and updated for the Newfoundland Museum, traces the somewhat colourful history of the wolf in Newfoundland history. According to Maunder, the first written mention of wolves on the Island, dates to 1578. Captain Edward Haies, a member of Sir Humphrey Gilbert's expedition of 1583, also mentioned wolves. 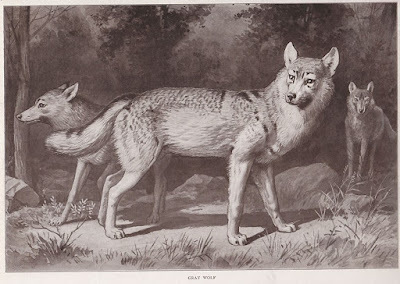 “From that time onward, a great many Newfoundland letters and journals contained at least minor references to the species, so great seems to have been the fascination with wolves in the early days,” says Maunder. By about 1930, sadly, the Newfoundland Wolf was extinct, existing only as a few specimens, and an occasional local legend like that of Deadman’s Cove. Special thanks to Doug Wells for the story and photo. This story appears in my book Haunted Waters, available as ebook for Apple, Nook, Kindle, and Kobo!